I have a 2000 Glastron SX 175 Runabout that is starting to have electrical problems with the gauges. When I bought the boat about a month ago, all worked fine. First, my fuel gauge started to peg on "F" rather than displaying the correct amount in the tank. When power is off, the gauge returns to "E". I pulled the float from the tank to ensure the float was not hung and reinstalled it. I have a full tank now, so I'll have to wait to see if that is fixed. Next, my temp gauge began fluttering. This problem appears to have been corrected when I disconnected and reconnected the wiring plug in the engine compartment. Finally, my tachometer is completely dead, when the engine is started, the tach doesn't flinch. Any ideas on how to go about troubleshooting this? 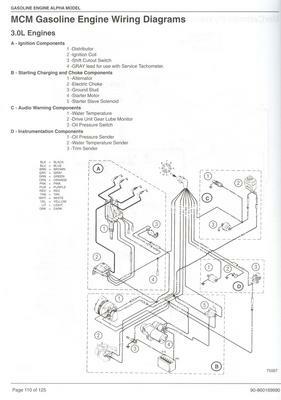 The wiring diagram from the owners manual is attached. Does your battery charge when the motor is running? You may have a bad voltage reg or stator !The first thing that I would check is your grounding system and check to be sure you have 12vdc on the gauges, just because the lights on the gauges are working doesn't mean you have a good enough ground. The only thing besides the voltage reg ,rectifier & stator is the gauge itself and the wire running back to your voltage regulator.